You are here: Home / Holidays / Back to School / Lunch Box Jokes for Back to School! 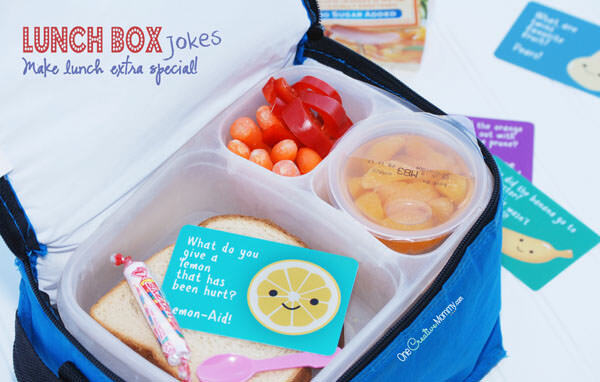 Lunch Box Jokes for Back to School! 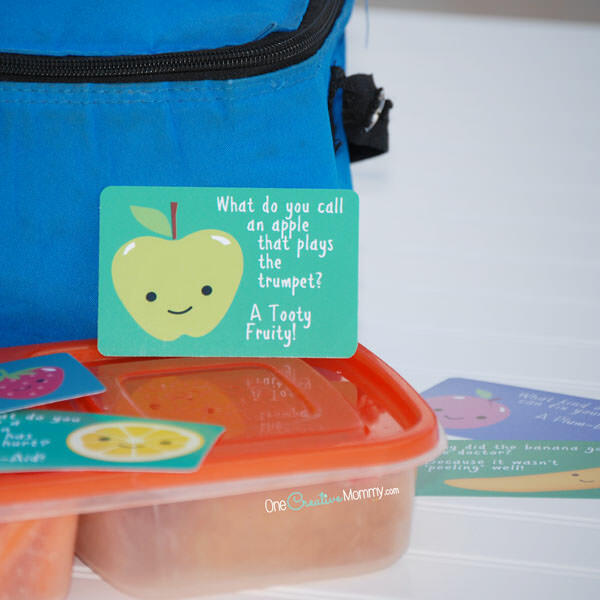 If you’re nervous about your kids going back to school like I am, you’ll love my Lunch Box Jokes! Combined with a lunch box full of their favorite healthy treats, the kids are sure to have a good lunch-time experience. I’m super excited that the kids are back in school, but I’m also nervous for some of my shy kiddos. Two of my kids will get to choose where they sit at lunch. No more assigned seating by class. It can be such a scary thing to find friends to sit with at lunch. 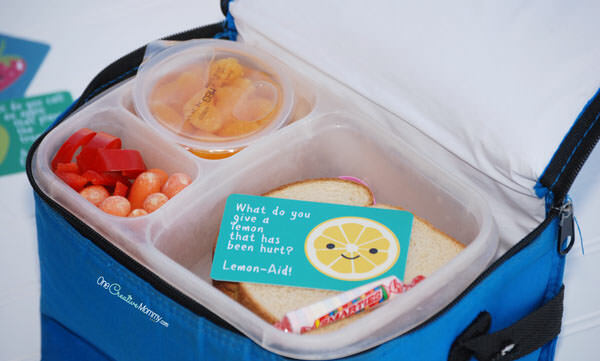 This year, I packed a little something special in their lunches to help them start the year right. I sent lunch box jokes and mandarin orange fruit cups. The healthy and tasty treat gave them a boost of nutrition, and the jokes gave them a smile and a reason to talk to a new friend. Do you remember when you first got to choose where you sat at lunch? I do. It was seventh grade. I loved it, and I hated it. Once I established a group of friends, it was easy. We had our spot we sat in each day, and I knew that my friends were waiting for me. But, what about those first few days of school? They were scary. I didn’t know who would have my same lunch, I didn’t have the confidence to believe people would actually want to sit by me, and I was terrified to choose a place to sit! Remember those days? The weekend before school started this year, we went over my post about How to Make Friends (we do it every year, and the kids love role playing being the new kid). We also got our Back-to-School Friend-Maker game ready (another yearly tradition). In the game, we always include a challenge to ask someone to sit with them at lunch. I’m proud to announce that my girls all did the challenge. Yeah! The other thing I like to do the first week of school is pack the kids’ favorite snacks. It’s so nice to have something exciting and comforting in your lunch when you’re feeling nervous. My kids love mandarin oranges, and I don’t buy them very often. That makes them extra special in their lunch! So, what do you do to make your kids’ first week back at school extra special? I’d love to hear about it in the comments! 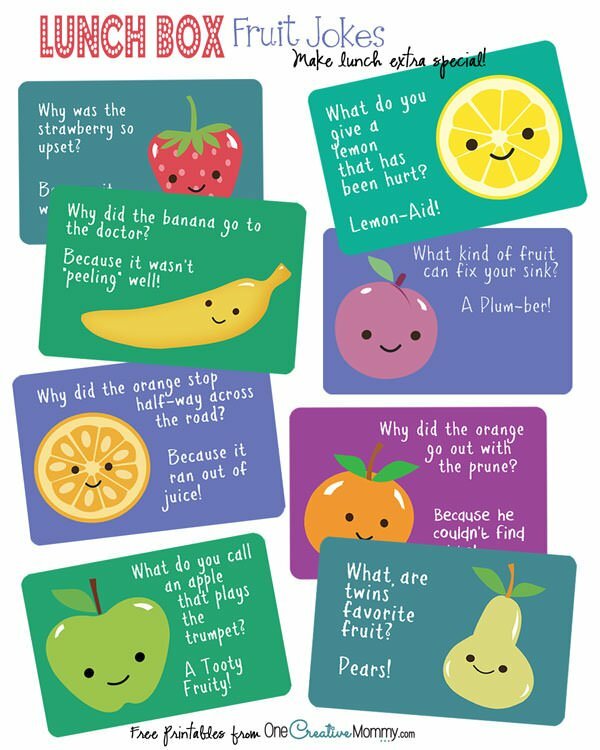 Ready to send some jokes to school with your kiddos? If you’d like to make your very own set, click the download button below to be taken to my download page. Still here? I have lots more great ideas to share! 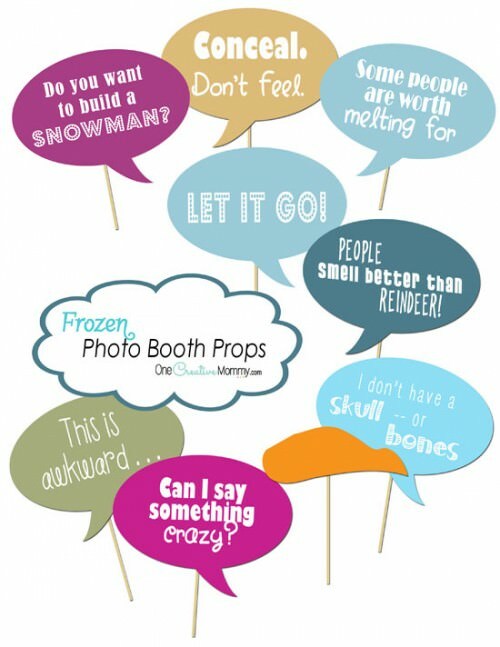 Be sure to follow me in some way so that you don’t miss out on any of my future printables! How cute! I wish they had those when I was a kid. My mom used to leave us notes and rhymes. I think it’s such a neat surprise. Thanks so much, Mitzi! It’s always fun to see something other than food in your lunch box! Hehe, I love this idea! Thanks, Jess. Who doesn’t need a good joke once in a while? Thanks so much, Marilyn. I sure hope so! Lunch can be a tough time when you are shy! What a sweet idea. Thanks for all of the printables! You’re welcome, Heather. Thanks for taking the time to comment. Enjoy them! 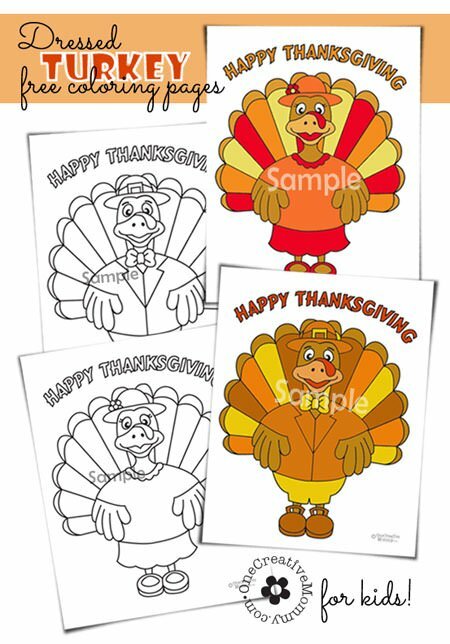 These are sure to make the kids smile at lunch! Thanks for the invite, Felissa. I’m all linked up! These are so cute. I wish I found them when my kids were little. Thanks, Candi. I’ve been known to send them in my hubby’s lunch, too! Who says lunch notes are just for kids? I’m so happy I found these! My daughter just started school today at a new school so these will come in handy.I’m so excited! Thank you for linking up to the Bloggers Brags Pinterest Party. I have pinned your post to the Bloggers Brags Pinterest board. Thanks so much, Carie! I hope your daughter had a great first day and that the lunch jokes will cheer her up a bit if she feels nervous at her new school. We don’t have kids, but I’m pretty sure my husband would love these! I usually make him lunch for work and he loves puns. Visiting from Create it Thursday! I agree! Lunch box jokes are perfect for husbands, too! Such a cute idea Heidi!! What a great way to remind your kids that you are always thinking of them! Thanks, Megan. The kids really get a kick out of it, and so do their friends. 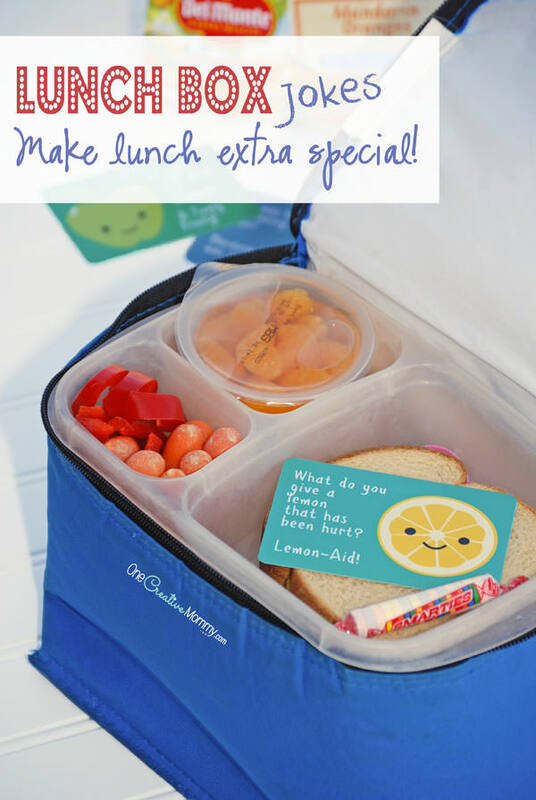 Love putting little notes or something special in lunches. Thanks for sharing these. Pinned. You’re welcome, Erlene. It’s really fun to try to surprise them! Love these jokes – and they’ll be just perfect for little ones going back to school. Thanks, Clare. Sorry it took me so long to respond. I missed this comment, somehow!